California’s endemic fishes are remarkably adaptable. They evolved to survive decades-long droughts and the highly variable stream flows that come with the region’s Mediterranean climate. But can these fishes persist through extreme drought today, with all the dams, invasive species, pollution and other anthropogenic impediments to their survival? To help find out, Center researchers are taking the pulse of nearly 70 streams and rivers across northern and central California in the summer of 2014, the third straight year of drought. Center scientists are evaluating habitat conditions (e.g. temperature, flow, riparian vegetation, sediment) and sampling by electrofishing to document the composition and density of fish communities. They are assisted by the U.S. Forest Service, U.S. Environmental Protection Agency, Zone 7 Water District in the East Bay and Cache Creek Nature Preserve. The researchers chose streams that have data from earlier fish community surveys for comparative analysis. Some sites have been repeatedly sampled for 20 to 30 years. Is the current drought hastening the decline of native fish? For the streams that are more impaired, will this drought be a “resetting event” that completely wipes out native fishes and leaves them no way to recolonize once normal conditions return? 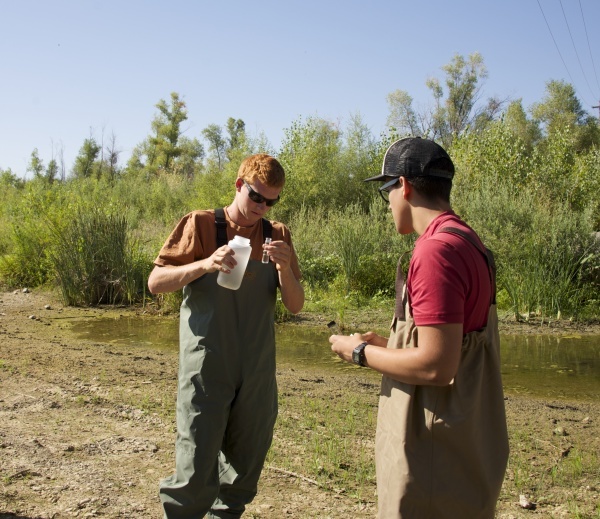 Photo: UC Davis undergraduate research assistants Scott Perry (left) and Jesse Vargas take samples in early July 2014 at the first study site, Cache Creek, near the Yolo County community of Capay. Photo by Margot Boorman/UC Davis.